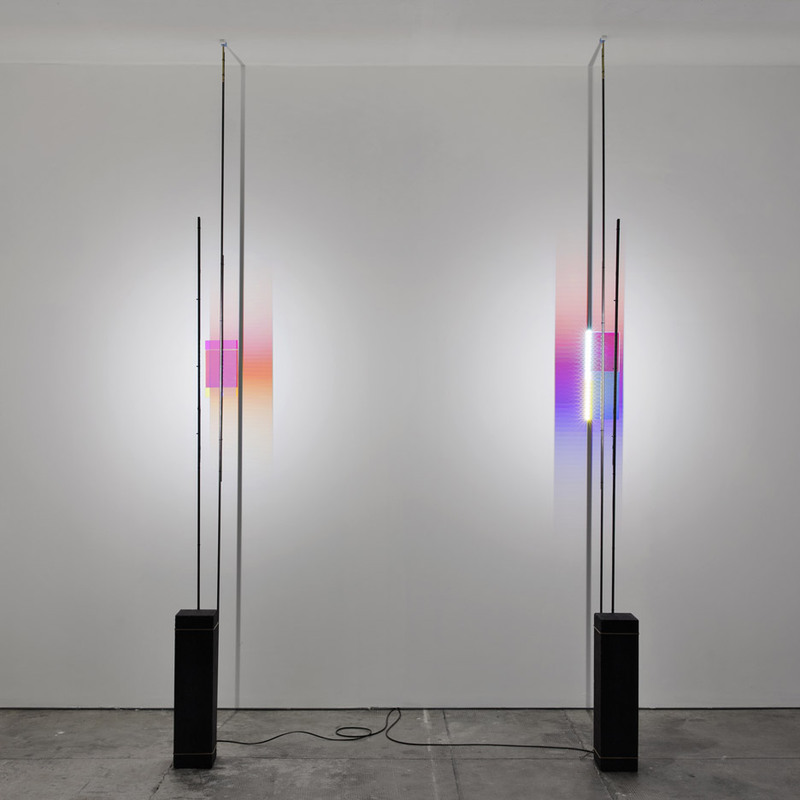 Amsterdam-based duo Formafantasma is hosting a solo exhibition that explores the "expressive qualities of light" at the Peep-Hole Contemporary Art Centre in Milan (+ slideshow). The Anno Tropico show opened last week, and features a range of new pieces and site-specific installations created by the studio over the past year. Formafantasma's Italian founders Andrea Trimarchi and Simone Farresin frequently experiment with unusual materials, with past outcomes including cow-bladder lights, fish-skin stools and plastic made of beetles. Trimarchi and Farresin also previously created a series of objects dedicated to the passing of time. The duo have now directed their research towards light, creating a series of pieces that range in size and application, but are all themed around the subject. "These objects mark an important passage in the designers' practice, now closer to the industrial sphere than to crafts," said a statement from the studio. "At the same time, the working models confirm that the procedure and approach are still based on intuition and experimentation." The pieces are designed to "shape" light, generating reflections and shadows in the gallery space. Items such as dichroic glass, optical lenses and a parabolic mirror are assembled with industrial materials like bricks and iron rods. Lamps formed from thin poles, both stood on the floor and suspended from the ceiling, direct light from small bulbs in a variety of ways. Brass is used for a series of designs for its weight and reflection, and gives a nod to the work of Romanian sculptor Constantin Brâncuși – well-known for his use of the metal. Most of the objects were created as circular structures, reminiscent of astronomical rings and an armillary sphere – a revolving model of objects in space centred around the sun or earth. The products are accompanied by a series of drawings and diagrams on millimetre paper that present details of Formafantasma's designs. A video at the end of the exhibition shows the experiments conducted by the designers in their studio, accompanied by an off-screen voice that describes "luminous phenomena on a cosmological level". Formafantasma's other recent projects include the catwalk design for fashion label Sportmax, for which lengths of translucent plastic were used to create "infinite loops" around the venue.